Slough International Freight Exchange (SIFE) comprises the construction of a rail/ road freight interchange including approximately 195,000m² of B8 distribution units. The development will consist of railway sidings with a connection to the Colnbrook branch line and an intermodal terminal incorporating two overhead gantry cranes and external container storage. 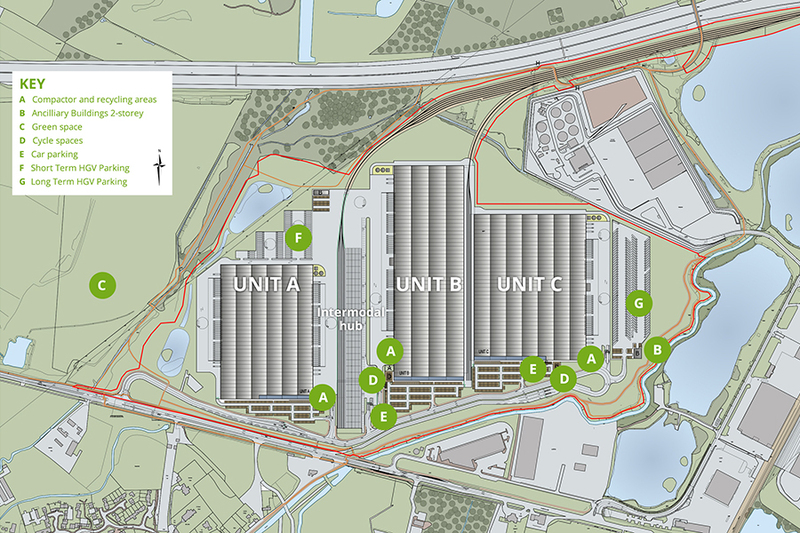 The three large distribution centre’s include associated landscaping, access, parking and servicing areas as well as a large lorry parking area with facilities. The development will create two new vehicular accesses with the A4 Colnbrook By-Pass and also include off site junction improvement works on the local highway network. Fairhurst have been appointed to provide civil and structural design services. Throughout the Planning Stage of the project Fairhurst’s have provided engineering input in support of the Planning Application. This has included advice on Traffic and Transportation and Civil Engineering input on drainage, flood risk and geo-environmental matters. The scheme is of strategic importance to Highways England and a previous Planning Application by a former owner of the site was refused at Appeal. To avoid the project meeting a similar fate has required extensive and close liaison with Highways England, Slough Borough Council and Heathrow Airport Ltd. to gain support for the scheme.